After a few months of blogging holiday this blog is back. Obviously the focus will change, we’re not anymore in electoral period, and thanks for that. There will be politics discussed though, and in case you were wondering I’m not anymore a member of any party and this because I don’t feel that there is one party left in Britain that reflects my opinions. I still think that the Lib Dems are the less bad of the three mainstream parties but I can’t really find it in me to feel associated to creeps like George Osborne, Eric Pickles or Michael Gove. If Nick Clegg will decide that he has a mandate to veto a few of these people’s policies then I’ll reconsider. It’s with immense pleasure that I can report that on 15th December in a written reply to Caroline Pidgeon AM the Mayor of London Boris Johnson outlined the timetable for a green man crossing at Courthill Road. In answer to a previous question on Courthill Road junction in Lewisham (Question number 2981/2010) you stated: “Traffic modelling and discussions with key stakeholders are continuing to this end, and are scheduled to be completed by the end of this calendar year.” Can you please provide an update as to how far this modelling and discussions has actually progressed and how close Transport for London are to finding more ”radical solutions” as an alternative to providing pedestrian facilities at this junction as requested by current and former ward councillors and many local residents. TfL is developing a design proposal for Lewisham High Street at its junction with Courthill Road. Part of this proposal is to introduce a “green man” pedestrian crossing facility on Courthill Road. 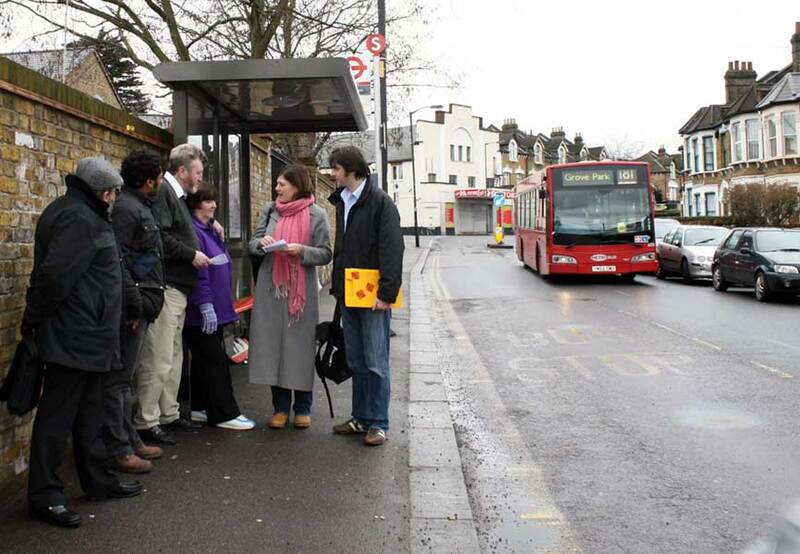 I went out on site with TfL’s Chief Operating Officer London Streets and Heidi Alexander before she became an MP. The traffic modelling is completed and the preliminary design will undergo a road safety audit which is planned to be completed in January 2011. Consultation on the scheme is planned for early in the New Year. As the proposals include banning some movements at the Courthill Road junction, with displaced traffic being diverted onto other local roads, feedback from the consultation process will potentially affect not only the final outcome but also the timescales for delivery. If a viable scheme can be developed, TfL has provisionally programmed detailed design to commence in the summer of 2011 with works commencing early 2012. This is the result of the coordinated pressure that residents of Lewisham Central have put onto TfL over a number of years, thanks to all those that helped towards this result. This blog has a Courthill Road tag to read about some of those efforts. For now, until the traffic lights are actually in place, let’s still cross it with extreme caution, I was almost run over yesterday and the railings on one of the corners have just been replaced after someone smashed into them. It’s the day after elections, and despite the fact that my wife and daughter came out as the biggest winners it’s no time to rest. In all frankness I hate elections and I’m glad it’s finished, we can go back to think about real issues. As I already wrote Lewisham Council is tendering a major contract for the running of most of our leisure centres. I write it here again to avoid it being buried under the electoral posts. Because this is really important, it’s an opportunity that comes round only every few years, we must set up our local social enterprise to run the centres, just like other boroughs did. Local talents working for the local community and re-investing all receipts in our community assets. A very bad night for my political side and I believe for Lewisham politics in general too. Thankfully I have a full life besides politics and plenty of things to keep me occupied, even too many. I have no regrets, I remained myself throughout the election. People showed support and went out to vote for me, thanks to you all. Unfortunately with the general elections on the same day many more people came out and voted for Labour, that’s Lewisham Central. Labour is back in full control with over 40 Councillors, Lib Dems fortunately retained 12 out of 17 Councillors. The Greens were nearly wiped out, they lost five and go back to Darren Johnson alone. The Socialists of Telegraph Hill were instead completely wiped out and as I left they were recounting the votes of Grove Park, where one Tory may have won, but maybe not. The general election results for Lewisham are in and there are no great surprises there. Let’s start with some heart-felt congratulations to Heidi Alexander for winning in Lewisham East. Commiserations to our candidate Pete Pattison that did put up a great fight and would have made an excellent MP as well. The residents of Lewisham East were really spoilt for choice between two strong candidates of great quality. The numbers are of great comfort and a great hope for the Council’s count that will start later today. In Lewisham East the swing was 6.4% from Labour to the Liberal Democrats. But Lewisham Central is not anymore part of that constituency, we’re now in Lewisham Deptford and our MP is Joan Ruddock, re-elected with a smaller but still sizable majority. Still, even here in Lewisham Deptford the vote swings 3.6% from Labour to Lib Dems. Well done to Tam Langley for her sharp campaigning and this result, that given the national squeeze of Lib Dem vote crushed between the Labour and Tories tribes, and given the limited number of target wards within the constituency, is truly remarkable. In Lewisham East Jim Dowd MP is also re-elected, again with a swing of the vote towards us Lib Dems, here this is 3.1%. What does this mean for the Council and Mayoral result? That it’ll be very tight. The count starts later on today and the full results will only be known later on tonight. Thanks to all those that voted for us and those heroic volunteers that helped us fight this campaign, we truly worked you out, keep your fingers crossed. It’s polling day, and in Lewisham Central there is an excellent Lib Dem team to vote. Max Calò (me), Ingrid Chetram & Dave Edgerton. For Parliament vote Tam Langley for Lewisham Deptford. For mayor vote for Chris Maines, the real opportunity to change Lewisham for the better. I’ll be out knocking on doors all day, I may see you at some point today. Haven’t yet made up your mind about how to vote? Come tonight Wednesday 5th May at Lewisham Bridge Primary School, Elmira Street, SE13 for the hustings organized by Action for Lewisham. The event starts at 5:30pm and ends at 7pm. Two contracts with leisure operators to run almost all the leisure centres of the borough are to expire soon and Lewisham Council is now advertising a major long term contract to run them all on a long term basis. The London Borough of Lewisham is seeking a partner to enter into a contract to manage, operate and maintain a number of existing leisure facilities (“the existing facilities”) together with 2 possible new facilities (“the proposed facilities”). The existing facilities comprise of the following leisure facilities : The BridgeLeisure Centre and Indoor Bowls Hall (Kangley Bridge Road, Lower Sydenham, London SE26 5AQ, UNITED KINGDOM); Ladywell Leisure Centre (261 Lewisham High Street, London SE13 6NJ, UNITED KINGDOM); Wavelengths Leisure Centre (Giffin Street, Deptford, London SE8 4RJ, UNITED KINGDOM). The proposed facilities are Forest Hill Pools (Dartmouth Road, Forest Hill, London SE23 3HZ, UNITED KINGDOM) designed to replace the formerForest Hill Pools on the same site, and a new leisure facility development at Loampit Vale designed to replace the existing Ladywell Leisure Centre. The Council proposes to award a 10-15 year contract in relation to managing, operating and maintaining the Existing Facilities with options (exercisable by the Council during this term) to require the partner to manage, operate and maintain the Proposed Facilities (such additional requirements to be performed within the 10-15 year term). It is estimated that the services in respect of the Proposed Facilities (if the option is exercised) will commence in the second year of the 10-15 year term. Having watched closely how the leisure centres work in Lewisham I can surely say that there is a need of a serious re-thinking before committing to something like this. The way this works now is a complete muddle, with results like the legionella bacteria crisis, when following discovery of the bacteria in the showers at Ladywell these were shut down by the contractor following an order from the Council (but allegedly without the knowledge of the Cabinet Member for Community). The result of this decision was that people couldn’t shower before swimming and therefore the water of the pool was becoming infested with other equally harmful bacteria. The root cause was of course neglect, and at the root of that lack of funding for repair and maintenance. This is a unique opportunity to re-organize these services so that they are maintained to the level they should be. It is also an opportunity to involve the local sport talents and clubs and develop a long term plan of sport development for the borough to make use the current local infrastructure to its full potential. The first question to ask ourselves is how can we use these facilities at their best, and then look for the best way to run the centres to serve that plan. Maybe Lewisham can set up its own social enterprise, 4 centres are already an economy of scale, that’s how Greenich Leisure started, they now run 70 leisure centres. Why provide profits for shareholders when we could be reinvesting in our community assets? Historic third party income levels in operating the existing facilities has been in the region of 1 940 000 GBP per annum (excluding VAT and the Council’s management fee). It is projected that income may not meet expenditure to manage, operate and maintain the facilities, thus, the contract awarded may involve a level of management fee payable by the Council. Further financial details will be provided in the tender pack and other procurement documents. It can also be the way to keep services going and dodge those cuts that no doubt will soon hit our budgets. Possibly the greatest Liberal gathering in Blackheath since Gladstone, yesterday’s visit of Nick Clegg was a very busy affair. Despite a miserable looking weather the people of Lewisham came out for Clegg, eventually outnumbering the members of the press of a factor of 4 to 1. But instead of writing a full report I’ll just link to more impartial commentators that wrote about it soon after the event, when I was back on the road, knocking on doors. The Blackheath Bugle explains why Clegg was in Lewisham, Dave Hill spoke with the man himself. For posterity. The moment Nick Clegg comes face to face with the Lewisham Central Lib Dems. 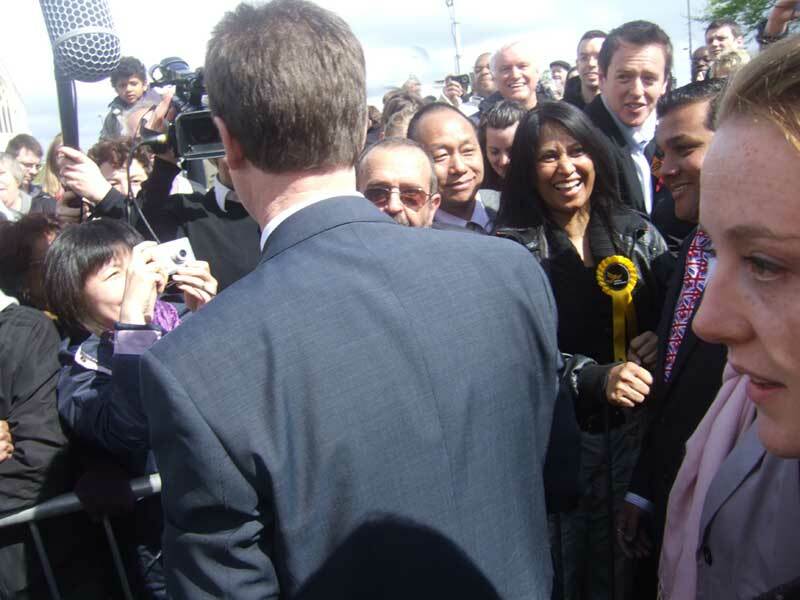 Councillor Dave Edgerton shakes hands with Clegg, Ingrid Chetram feels the energy, I took the photo. This Monday 3rd May – 10 am – Montpelier Vale, Blackheath, Lewisham, SE3 0TJ. Come and meet Nick Clegg with the Lewisham Lib Dems. The primary school places shortage is starting to hit. A COUNCIL is doubling the amount of reception children at a school despite it not having room for them. Brindishe Community School, in Wantage Road, Lee, is being forced to take on 60 reception children in September rather than the usual 30. Lewisham Council sent letters to parents offering places at the school even though the headteacher told the council it would not be possible to find room for them. The article also mentions that the Council has “created” 510 such extra places, that’s 33 short of the extra need identified in February, a number that Council officers assumed was going to increase due to late submissions. This Labour administration has failed to plan for the increase in numbers of primary school places. There was advance warning, there was an economic upturn, there were vacant sites that were potential opportunities for new schools. Lewisham Labour wasted all these opportunities and now is inventing school places out of thin air. In the US, we call this “Kabuki”. 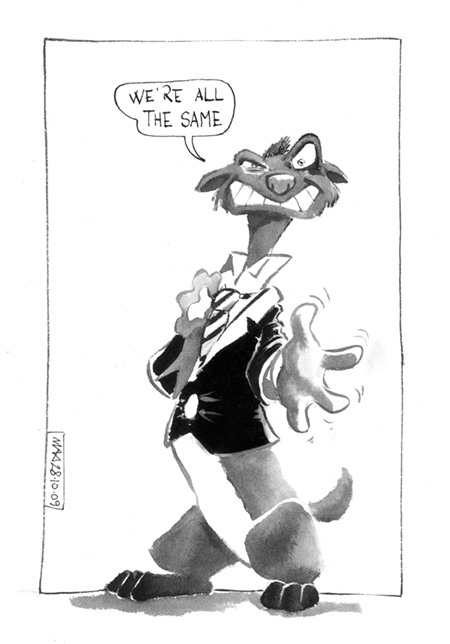 Vote for the meaningless amendment or bill that you know won’t pass in order to build a record so that you can claim that you voted against the war, for single payer health care, against FISA, whatever, and then go south when the vote that really matters comes up. The LibDems have this one 100% right, and, apparently, the voters in the UK are beginning to understand Kabuki as well as those of us here in the states. This above is one of the 60 comments left under Joan Ruddock’s article in Sunday’s Guardian Cif written in response to mine of Friday, they’re well worth a read (link). Poor Joan, she really shot herself in the foot with a big gun. And yesterday the issue was taken up by the South London Press that on page 3 featured this article. I finally have some time today to write a blogpost, it’s been a truly intensive and eventful day, a non-stop that started bright and early with leafleting to commuters outside Hither Green Station, followed by work, followed by a gruelling session of hand-delivering of letters to postal voters up and down the ward. This afternoon, as I touched home to pick up letters, I discovered that my post for Comment is Free was finally up there. Oh emotions! Finally! Finally I managed to say this story the way it deserves to be told. I am truly thankful to the Guardian for allowing me to say it from that platform. Because I believe that Joan Ruddock did a true enormity by claiming that she voted “against the Government going to war in Iraq” when she didn’t take part to that vote at all. This story doesn’t end here. Click here to read my piece on Comment is Free. Many thanks to LVIG for organizing yesterday’s hustings meeting, it was very well attended and the questions raised from the floor were excellent, I was very glad to be there representing the Lib Dems and explain what our plans for the future of Lewisham are. I found myself surprisingly ferocious against the Lewisham Labour administration, but surely people could appreciate that there is some real distance between us and them and we’re not “all the same” at all. Another wonderful day without the noise of air traffic above our heads has just started. I think that now that we savoured what life is without that constant noise we’ll be more careful before agreeing to more planes to fly above us next time new routes are proposed. I find that quality of life has improved, in fact, as you may gather by the tone of my writing, I’m in a very good mood today. I’m also of such mood because I’m enjoying canvassing, especially when the Lib Dems are so much on the up and people responds so well to our knocking on their doors. And this is quite visible in the amount of window posters and stakeboards that are going up in the ward. Do you support us? Do you want a window poster or a garden stakeboard delivered to you? Just email me. And if you want to help with leaflets and canvassing then join us, this week we are meeting every day from Monday to Friday outside the Kids Corner (corner between George Lane and Hither Green Lane). The appointment is for 6pm on Monday, Tuesday, Wednesday and Friday. It’s instead for 5pm on Thursday. It’s time for the final push to move Labour out and help in a new Lib Dem administration for Lewisham. With your help it can be done. The excellent website Liberal Democrat Voice has selected 10 key Parliamentary votes to help the public understand how liberal or authoritarian your MP has been during the last Parliament. Now, if you enter Joan Ruddock MP you’ll find that she’s “only” 90% authoritarian, and this because despite backing government on each and every authoritarian proposal from ID cards to trial without jury, in 2007 she was absent on the vote to exempt Parliament from the Freedom of Information Act. Only that despite missing the vote she’s on record as a ringleader of that proposal. The bill was indeed approved at the Commons but failed at the House of Lords, if it hadn’t one of the things we wouldn’t have known anything about would have been our MPs expenses. So, despite missing the vote we cannot at all say that she didn’t support it, because she did. Her 90% authoritarian score on the Lib Dem Voice Rank is only an appearance, she’s 100%. 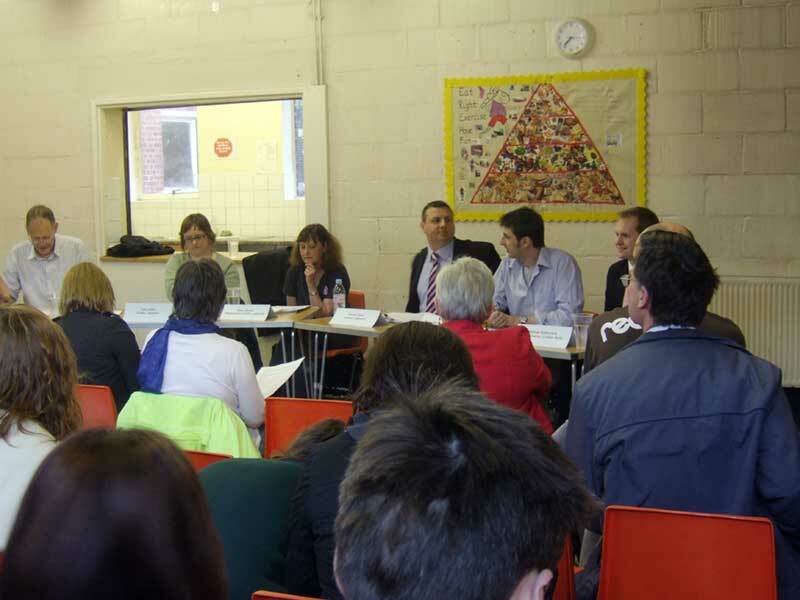 The Ladywell Village Improvement Group (LVIG) is hosting a hustings for Council hopefuls, and since part of Ladywell falls within the borders of Lewisham Central there I will be. The meeting takes place at 7.30pm on Wednesday 21 April at the St.Mary’s Centre on Ladywell Road, SE13 (also within Lewisham Central borders). People are invited to submit questions in advance by emailing ladywellfields@yahoo.co.uk by midday of Tuesday 20th April. At that point the submitted questions will be forwarded to the candidates so that they can prepare answers. This electoral debate will follow a strict format with 5 minutes for each party to make a presentation speech and 2 minutes to answer to each of the questions, please note that the organizers want to focus on Ladywell and the Borough, not on national politics. To make sure that your question is put forward please be also present at the meeting to read it aloud, submitting it in advance but missing the meeting may end up with the question being relegated down the agenda and possibly not being asked. The event closes at 9pm and adjourns at the award winning Ladywell Tavern for further discussions. For those more interested in national politics the Deptford Dame has also details of a parliamentary hustings for Lewisham Deptford taking place this Saturday April 17, 5pm, at the Utrophia Arts Project at Tanners Hill, SE8 4QD (entrance opposite the Royal George pub). Our Lib Dem candidate Tam Langley will be there to impress you. The letters in the South London Press are getting increasingly interesting, I’m preparing to some kind of response to my one that was published in the paper version of the SLP last Friday. LEWISHAM Mayor Steve Bullock came to power promising a new secondary school for the north of the borough. Eight years have passed and this mayor has not only been unable to deliver on that promise, he also created an even worse gap at primary school level for the whole of the borough! The news that this year there are 543 more applications for reception at Lewisham’s primary schools than available places is just shocking (“‘Crisis’ after applications for reception places soar”, South London Press, March 26). All of our primaries will be overcrowded and hundreds of children will have to be crammed into portable buildings, music rooms and who knows what other unsuitable venue. This was avoidable. The number of children in a borough varies over the years but we always know exactly how many are born in each year and can therefore make a fairly accurate ballpark estimate of the needs five years ahead. Warnings about sharp increases in numbers had indeed been issued and decisive action was therefore required. Reading the council’s schools strategy papers, one can find no trace of any meaningful effort to try to provide enough school places for those numbers of children. That’s why we are where we are. As a community campaigner who has been long aware of the shortcomings of this administration I am not surprised, but as a father of a child about to start school in Lewisham I feel a special kind of anger at this news. I’ve been forwarded this letter that Joan Ruddock MP has sent to a selection of Lewisham Central residents. 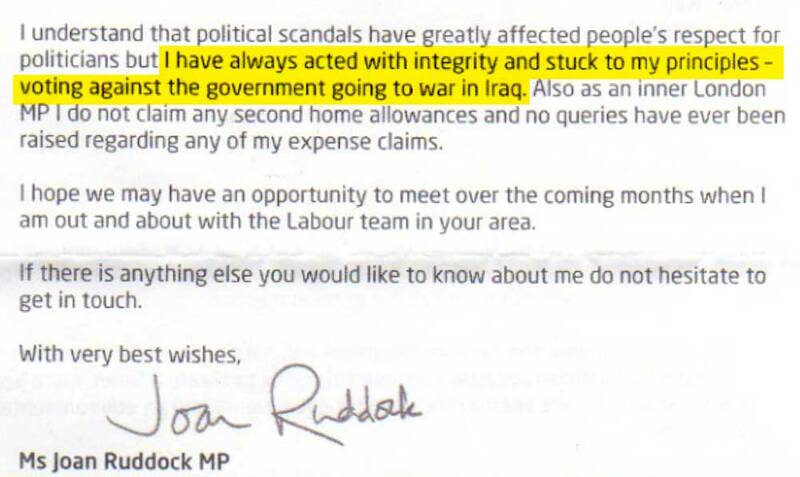 I read it and gulped, again, the claim that Joan Ruddock voted “against” the war, only in a much clearer and unequivocal phrasing. 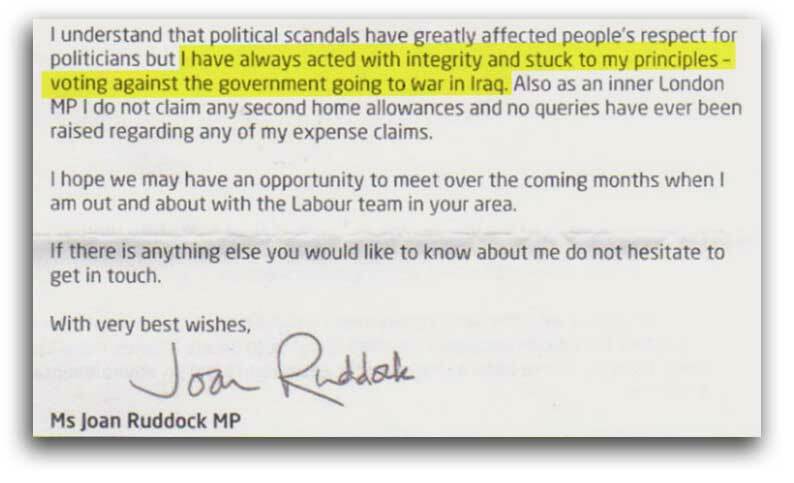 Now, let’s be clear, Joan Ruddock is on record as absent on the crucial occasion of the Government’s motion to authorize the use of force against Iraq. That’s a fact. She was also absent for every other vote on the main motions about Iraq. What she did vote for were proposals to amend those motions on Iraq by inserting clauses saying that the case for war was yet unproven, but those attempts were always defeated, and following those failed votes for amendments the main motions went to vote, and on each and every occasion about Iraq she was absent. So, I don’t think she’s being straight at all by saying that she voted against the government going to war in Iraq. She didn’t do a Robin Cook or even a Diane Abbott, at the crucial moment she wasn’t in the room. Something that voters should know, and that can potentially affect her chances for the forthcoming elections since it’s not just an embarrassing statement but also a great way to remind people of the clear position that Lib Dems took against the Iraq war. She’s the incumbent with a large majority, but the debate is just starting. 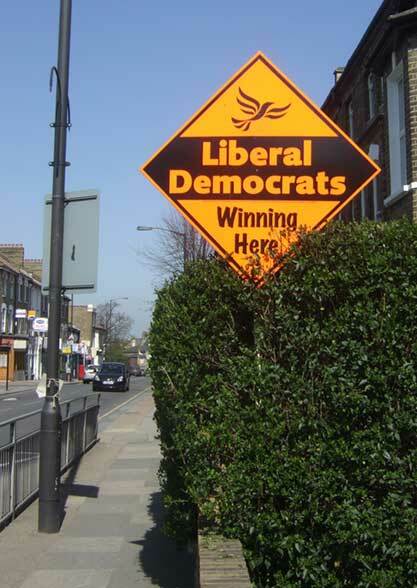 Lib Dems were the second party in Lewisham Deptford in 2005 and with the redrawing of the constituency boundary to include Lewisham Central ward (where Lib Dems are the first party) our chances have increased. Transport for London (TfL) is currently consulting on the location for 2500 new countdown displays for bus stops to be rolled out across London next year. 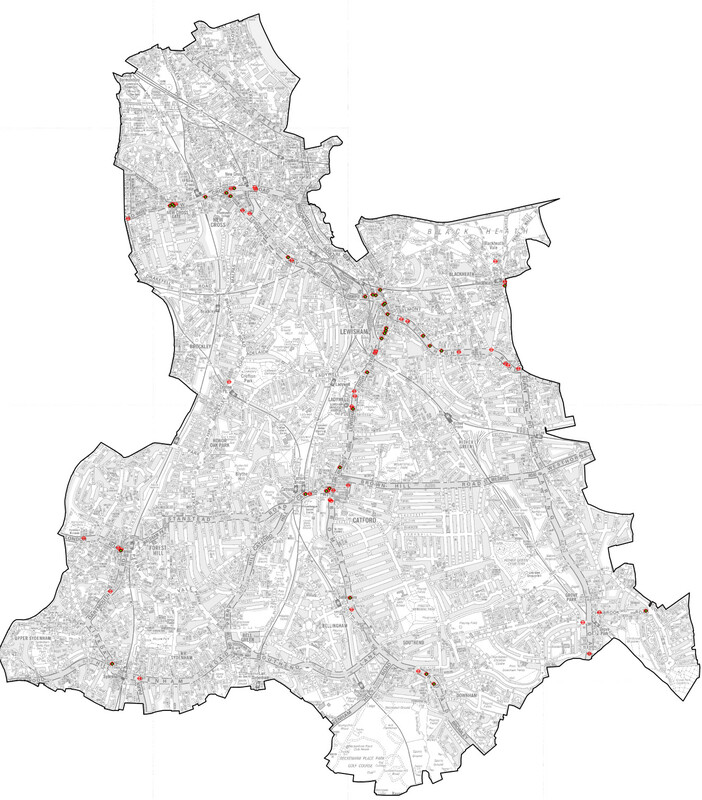 The map of the locations for Lewisham has been published, unfortunately not one of these displays has been allocated to Hither Green Lane (click on map to enlarge). We Lewisham Central Liberal Democrats think that there is a strong case for one of these displays to be placed on Hither Green Lane, we also think that we fit well one of the criteria chosen by TfL for eligibility, that of interchange value, especially when including walking as an alternative, a mode of transport that’s often only praised but not actually promoted through transport strategies. In fact many waits for the bus on Hither Green Lane are either made to go to Lewisham Station for the DLR or to Lewisham Market, both places that are in reach by walk and a decision to walk could often be made if the time for the wait was known. What instead currently happens is that people dithers in indecision indefinitely, until, often much later, the bus arrives, and many times when it does it’s overcrowded. We also have a train station, which obviously increases the interchange value even further, as many people do take a bus after the train and this means that a countdown display would be of value also to people living beyond the immediate vicinity of the bus stop. In both these cases a known wait would often result in reduced overcrowding on buses and an increase in pedestrian journeys, both very positive results from the point of view of transport planning, and it’s with this argument that we ask for a countdown display for Hither Green. Our proposed locations are Hither Green Lane and Springbank Road. TfL is consulting with Councils, not individuals (click here for the consultation documents pack), but we decided that we will make a representation anyway and we also found a powerful advocate in Caroline Pidgeon AM, who is the Chair of the Transport Committee at the Greater London Assembly and will support our case. Please add your name to our petition, and if your personal experience is one where a countdown display would clearly be of benefit then please tell us about it in the comment box so we can submit it as a sample case. This is the blog of Max Calò. Would you like my opinion on something else?